This autumn seems to be particularly rich in arts and culture in London and one exhibition that has particularly captured your author's attention is Turner and the Sea, which opens today at the National Maritime Museum. 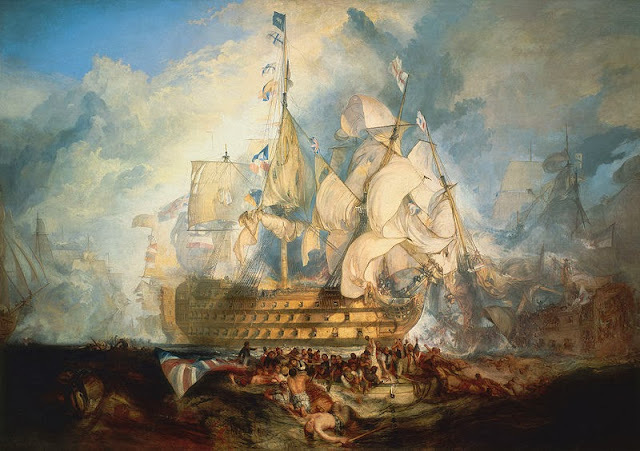 The exhibition presents the paintings of Turner and others over a number of themed rooms, including celebrated works such as The Fighting Temeraire, displayed alongside works more regularly seen in Greenwich like The Battle of Trafalgar from the Greenwich Hospital Collection. My dad did architecture and engineering in first year uni, before deciding that his future lay in engineering. I asked him what he remembered from his one year foray into art history (1939) and one work stood out head and shoulders above the others - The Fighting Temeraire! Now at 91 he would still have gone to the National Maritime Museum, had it been possible. Just bought tickets to this yesterday for our upcoming trip to London - cannot wait!